when we know that each person will build their own? Truth (or interpretation of data) often reides in the eye of the beholder. Pretending that a collection of data can be substitute universal truth seems to be quite a stretch. Even if that collection is captured in a state of the art Data Warehouse architecture. As Truth is based on interpretation foremost, allowing for different interpretations could be key to Business Intelligence success. Maybe we could agree on how to collect and store facts, (like in a Data Warehouse), but should then encourage people to define their version of truth? As these users uncover new layers within their own version of truth, they will undoubtedly become hungry for more ... facts. Our capability to gather and incorporate new facts then becomes the main course on the BI menu. Will you be able to eleminate all arguments about differences in interpretation? But if individual versions of truth are based on the same facts, then arguments will be about interpretation. Arguments about interpretation will lead to choice. And making informed choices, isn't that what Business is about? then Data Warehouse Automation will help you develop a single common version of the facts. 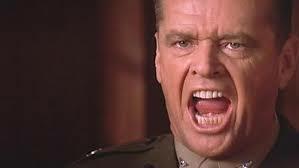 (*) court climax scene with Jack Nicholson, Tom Cruise, Kevin Bacon ... certainly worth your 2'38"